You know when you have so much going on that you feel like you’re just barreling through the day to get things done, but with no particular plan in mind, all you’re doing is keeping things going? That’s how I’ve felt for the last few months, maybe even years…But most of all this summer. This summer has been straight-up bananas. But I’m committing to getting things back on track, and I’ve teamed up with SodaStream to help me do just that — both with hydration, naturally, given it’s SodaStream, but I see it all as being tied into making life easier. 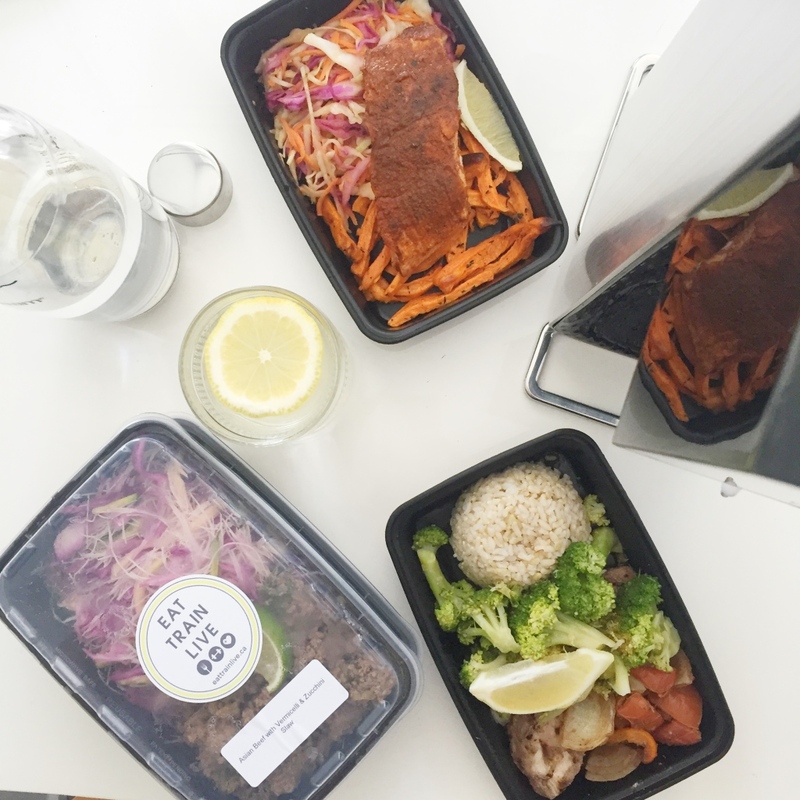 To help me do that, for the month of August, SodaStream has hooked me up with a healthy meal plan all month long from Eat Train Live. You probably know that I adore eating and while I do like to cook, when I’m cramming cooking into a hectic day and then have a pile of dishes to wash afterwards, it causes me more stress than anything else. 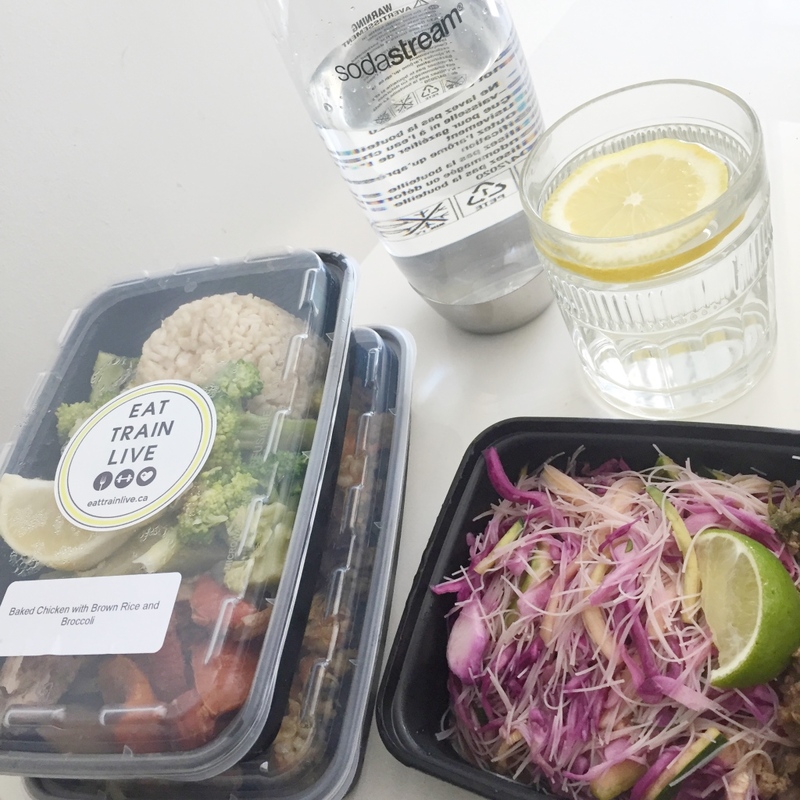 So for this one glorious month, my lunches and dinners are from Eat Train Live (I still make my own breakfasts), and I can then spend just a little time making a bevvie with my SodaStream Power so I can be well hydrated. I’m about two weeks into my Eat Train Live program and I am a fan: almost all of the meals are very flavourful (one chicken dish I found a bit bland, and I will say there is at least one or two salmon dishes a week, which is not my fave fish). Meal so far included Asian Beef with vermicelli and zucchini slaw, baked chicken with brown rice and broccoli, and 5-spice steak with vegetable fried rice. I must find out how they prep their chicken as it is always juicy (I think they must brine it — I’ve had success with that but am usually much too lazy to add this step!). The meals often feature sweet potatoes, which I feel I may grow tired of, but thus far, the meals are quite varied so I’m not bored. And while they might appear on the small side, I find each meal extremely filling. Seriously filling. I’m satiated for hours. In fact, so much so that this makes me think my diet was too low on protein before this meal plan (I do feel like I’ve never had more chicken and steak regularly ever!) as I feel full pretty much always (and sometimes I find it hard to finish each meal). Besides being tasty and filling, it’s the convenience of a well-made balanced meal. I honestly get a little giddy each time it’s time to eat and I have all of these well-rounded meals ready in two minutes. It’s given me time to reclaim some time for me. Which I need because I think I forgot that I have no time and added needing to swim regularly because I am maybe doing a try a tri in September (I say maybe because I may panic and back out!). As for how I’m hydrating with the SodaStream? Well, a bit of background: Although I gave up my habit of keeping a supply of soft drinks at home a few years ago, I do occasionally buy a single one to satisfy a craving (I grew up drinking pop and well, sometimes I just really want a soft drink!). But with my SodaStream Power, it provides me with the bubbles I love, but I can control what’s going into my fizzy drink and I can control how much sugar is in it. Thus far, to go with the meals, I’m keeping things pretty clean and crisp and am adding just add a slice of lime or lemon. Most of the Eat Train Live meals come with a wedge of citrus so I like that my water doesn’t interfere with the flavours of the food. I will start experimenting more though over the next few weeks, though. The SodaStream Power will be yet another tool to help me hydrate more (I have an arsenal of water bottles, too), which I know is key to my health and fitness. I realized once again how much less I hydrate than others on my recent week-long sailing trip to Greece, during which the other five guests guzzled (well, to me it was guzzling, it was likely a normal human level of hydration…) water every few minutes. I’d bet money I drank at most a single two-litre bottle the entire week. Hydrating regularly (except for when I’m actually running) just hasn’t yet become a habit for me yet. I’ve had the opportunity to go behind the scenes at a pasta factory and a cheese factor–both in Italy–an ice cream factory in Texas, and most recently, I visited Nestlé Canada’s test kitchen in Toronto, where I learned how the company is focused on improving the health of Canadians. “In 2012 we made a commitment that by the end of 2014, if we had children’s products that no longer met, or that couldn’t be made to meet, our Nutrition Foundation criteria, which are based on guidance set out by the World Health Organization and the Institute of Medicine, we would no longer sell them,” explains Kate Cole, a Registered Dietitian and Manager, Nutrition Health & Wellness for Nestlé Canada. This initiative has impacted 33 products–including top-sellers Smarties, Nesquik,and Nestlé Ice Creams–that needed to be reformulated, re-proportioned, or discontinued. Thirty-three products; that’s no small challenge. 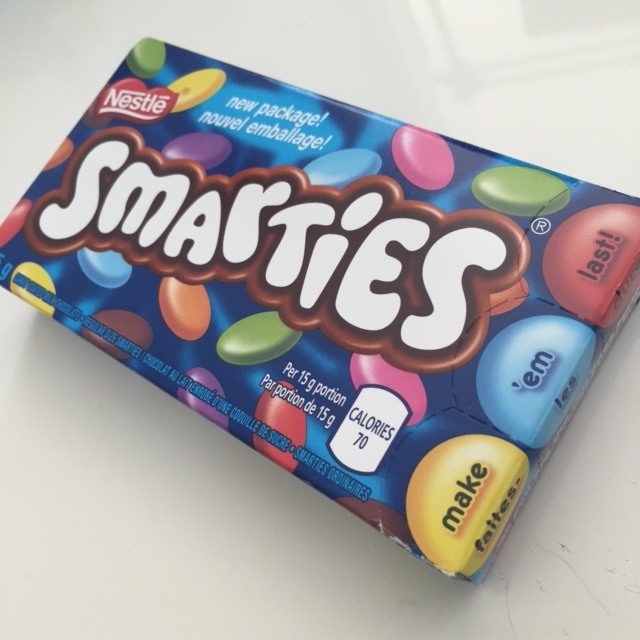 Take for example Smarties, which originally came in a 50 gram package containing 33 grams of sugar. To meet Nestlé’s new commitment, sugar had to be slashed to 11 grams per serving. The answer? Portion control. 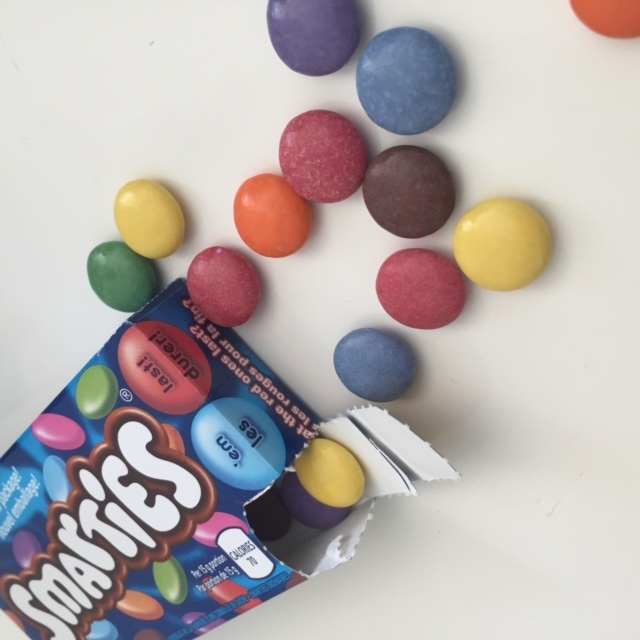 “The new packaging comes with three separate portion-controlled sections that contain 15 Smarties in each with a total of 11 grams of sugar,” explains Cole. “This way kids (and moms) can enjoy in smaller amounts.” (If you’re wondering about the candy’s colouring, the company took out artificial colouring in Smarties in 2009, which is why you may have noticed the hues are more muted than before.) But what didn’t make the cut? The Smarties King Bar. Even though it made the company money, Nestlé Canada discontinued the product. Nesquik , which comes in either a powder or a liquid formulation, was another product they had to tweak to have it meet the Nutrition Foundation criteria. While there was already an Original and a 1/3 Less Sugar version of Nesquik on the market, both needed a sugar overhaul. However, the Original powder version couldn’t be reduced in sugar without a big impact on taste. As a result, it was discontinued. Today only the 1/3 Less Sugar powder and both versions of the syrup are available. The 1/3 Less Sugar syrup has been reduced from 12 grams of sugar to 8 grams per serving, while the original syrup now meets the 11 grams per serving maximum dictated in the Nutritional Foundation criteria. And if you’re wondering how these changes impact taste, during my visit I did a Nesquik taste test, and I could not detect a difference. Both fulfilled that chocolate-y taste I know well since it’s a product I grew up enjoying. It’s not just food products that appeal to kids that are getting a makeover worthy of a reality-show reveal (don’t you just love TV makeovers?). “We are also reducing our sodium, sugar, and saturated fat in all of our products that don’t meet our nutrition criteria,” says Cole. In 2013 the company began reducing sodium in its frozen pizzas. To date, the company has reduced levels by 7 percent and they are on target to reach a 10 percent reduction by the end of 2016. (In a consumer comparison against its competitors, the reduced-sodium pizza offerings have continually won for taste preference.) Similar changes are being made to reduce saturated fat in Nestlé pizzas and ice cream. The company’s plans to be a leader in health, nutrition and wellness in Canada encompasses not just food products, but also extends to Nestlé’s employees (who benefit from nutrition training and discounted fitness memberships–which I wish all companies would offer their staff; it can only benefit your company if your employees are healthy and active!). Nestle also works with their suppliers (through investment in sustainable raw materials such as cocoa), and on the environment (by reducing the company’s waste and transportation-related emissions). Want more excitement in your life? Peeps who exercise experience more feelings of excitement and enthusiasm than those who don’t work out. Plus, you’re more likely to say you feel excitement and enthusiasm on days you were more active than usual. These findings are from a Penn State University study. Good reason to work up a sweat. Or this bikini (which I am utterly obsessed with) is another good reason for exercising, so you can rock your tone bod in it on the beach.